Thanks for the Great Times, Maysville KY!! September 2015 — It’s been well over a month since we left Maysville, Kentucky, but our travels there were so special that we have a few more tales to tell and photos to share in one last blog post here. 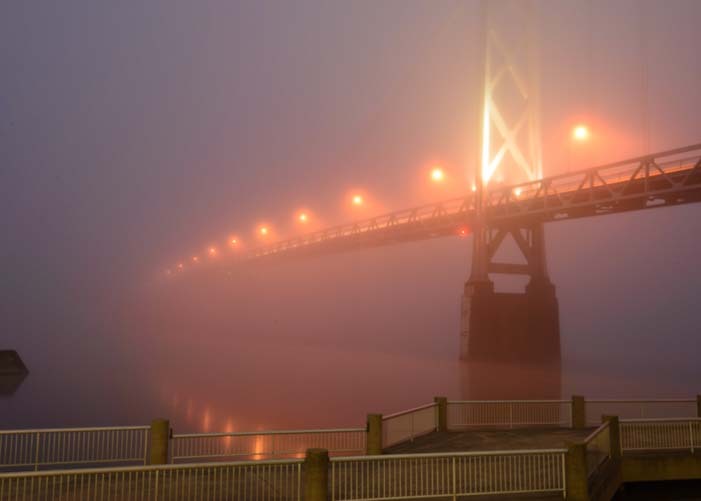 For starters, Mark got up early one morning and caught the town’s classic suspension bridge lit up in the mist just before dawn. What a beautiful sight! 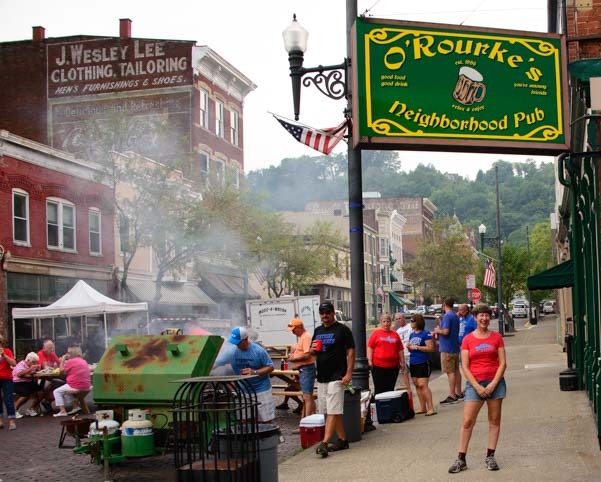 During our stay in Maysville we happily became regulars at O’Rourke’s Neighborhood Pub. Every afternoon we joined a special group of newfound friends for a pint. We ended up meeting lots of people and got caught up in conversation whenever we stopped in. To my complete astonishment, after Mark polished off his Guinness, he got up from the table and took off to put on his running gear too. I felt like a total bump on a log, but I was glued to my chair and couldn’t possibly imagine doing a 5k run at race pace right about now! 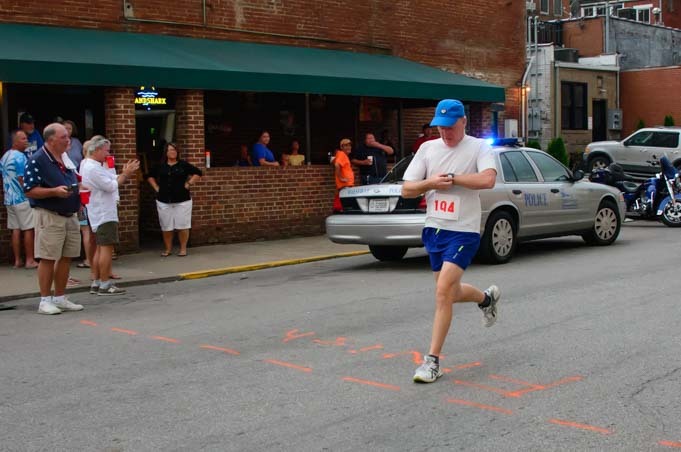 In no time, Mark returned in his running shorts and shoes and headed down the street to the registration table at Limestone Landing. It’s a good thing he had all that hydration in him, even though it was beer, as this particular afternoon was truly sweltering with 95 degrees heat and 95% humidity to boot! I was dripping with sweat just sitting in a chair in the shade! As I followed him to the starting line, I saw a whole slew of young kids lined up for a photo op. How fun! The heat wasn’t fazing them one bit. They were raring to go! Suddenly, the race started and they were off. A whole pack of people of all ages ran past me and vanished down the road. The finish line was in front of the bar (perfect! ), so, with nothing to do while they were gone, all of us bumps-on-logs went back to enjoying our beers and chatting on the back porch of the pub. I felt a little guilty for not doing the race too, but not that guilty!! After a while we saw some heads bobbing in the distance, and along they came. Mark sprinted over the finish line looking much too fresh for all that exertion, but he admitted he was pretty pooped. The kids, however, were just getting started. As a band played in the streets, they jumped up on the picnic tables and began to boogie, to everyone’s delight! 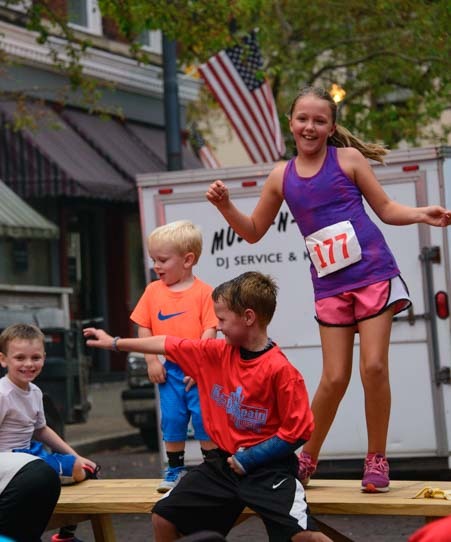 The running race sure didn’t wear out these kids…they were dancing on the tables and ready for more! 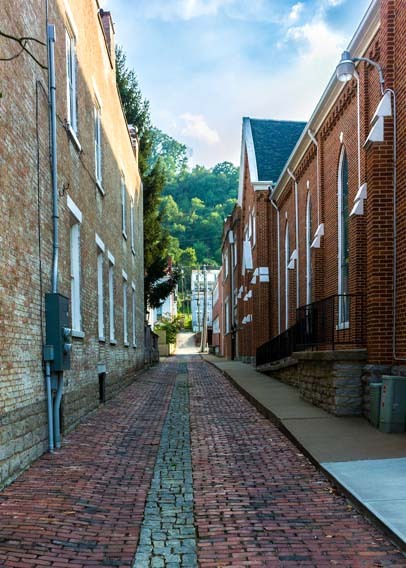 Parties in the streets, dancing on the tables, and live music all seemed like such a natural part of day-to-day life here in cute and historic Maysville. If there wasn’t an event going on outside on the brick streets, then there was usually something going on inside somewhere. No dancing in the street right now, but just wait! We took in a terrific photography exhibit at the Cox Building one afternoon. Photographer Rad Drew had taken most of the photos with a DSLR camera, but they had all been processed on an iPhone using iPhone apps. The results were gorgeous! 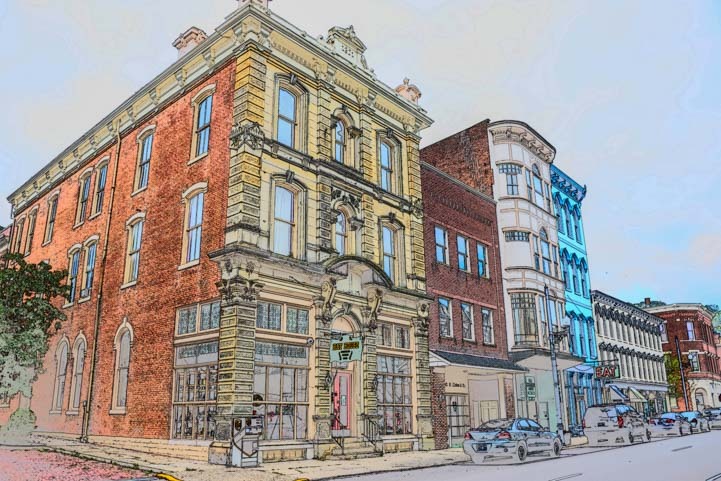 Maysville has its own Opera House which has recently been renovated from top to bottom. This wonderful theater hosts all kinds of performances throughout the year, and we were lucky to catch a fabulous show there. 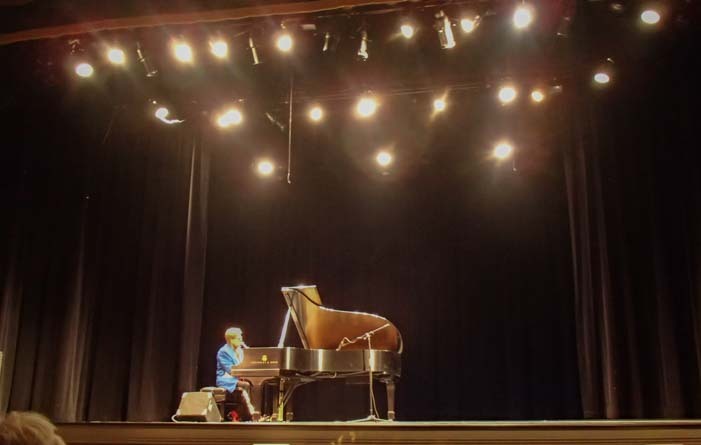 We had seen posters around town for a free Elton John tribute concert at the Opera House, and as we sat in the seats of this beautifully restored building, we were transported to a different time and place as performer Lee Alverson channeled the rock star on stage. Besides his great renditions of old favorites, what amazed us was when an announcer hopped up on stage and listed all the upcoming performances at the Opera House. Not only did the theatrical group the Maysville Players have a major production planned for every other month during the winter, but a medalist in the International Franz Liszt Piano Competition was on tap to perform a few days after we left. This is one busy stage! 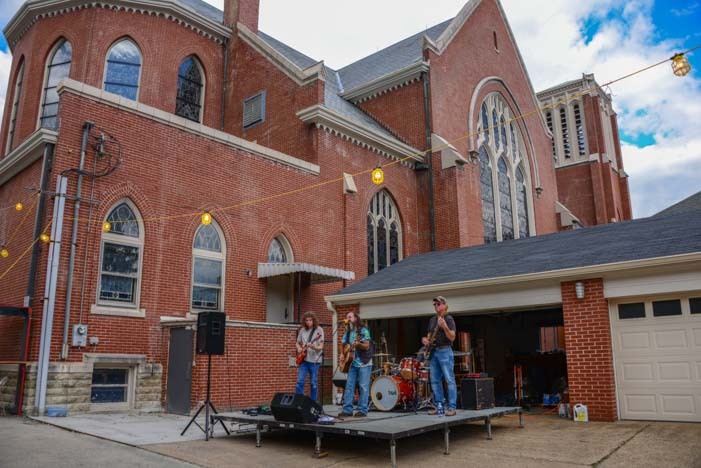 There were other kinds of free music being played around town too, and we enjoyed listening to a band at the St. Patrick’s Fall Festival at the historic St. Patrick’s Church in town . Just outside of town we found even more things to do. 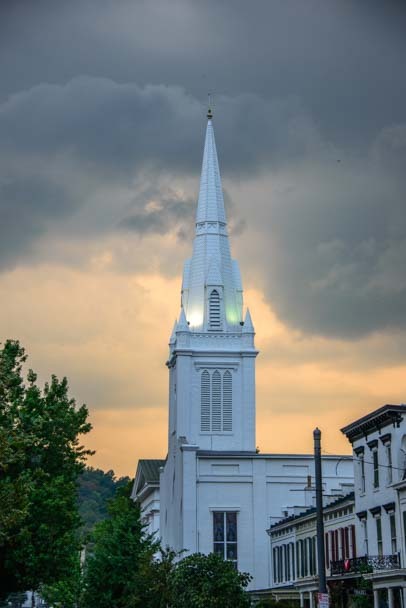 Before Maysville came into being, the village of Washington was settled just a few miles away. 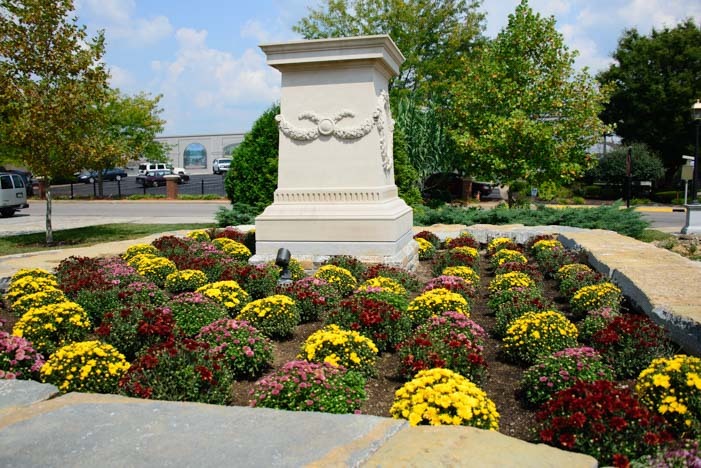 The area was first explored by Simon Kenton, and when the town was later formed, one of the trustees was Daniel Boone. A mural on the flood wall in Maysville shows how the earliest travelers came down the Ohio River on flat boats in the 1700’s. When they built their homes, they dismantled the flat boats and used the boards to build their houses. 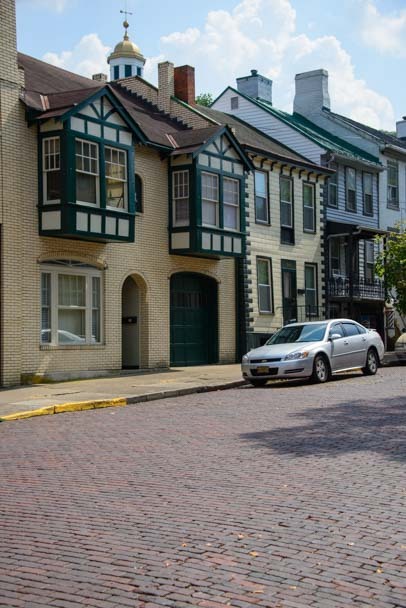 One such house in Old Washington was built by George Mefford. Those early settlers were made of some pretty tough stock. He lived here with his wfe and thirteen children!! Cozy living: a family of fifteen lived under this roof. Wow! Another fun building in town is the old post office. 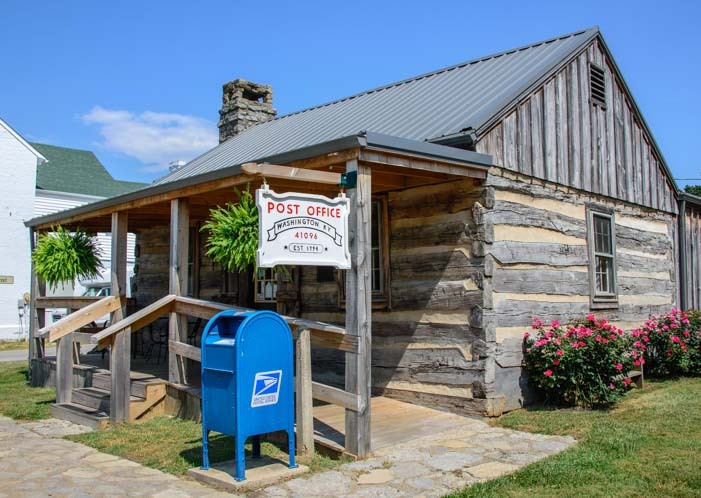 Established in 1789, it was the first post office west of the Appalachian Mountains, and it served settlers all the way out to Wisconsin and Minnesota. The town was also the site of a slave auction that was witnessed by Harriet Beacher Stowe when she was visiting a friend there. That scene later played an important part in her famous book, Uncle Tom’s Cabin. We were surprised to learn that during the Civil War, Kentucky did not side strongly with either the North or the South, instead finding itself split in its allegiance. Ironically, the little village of Washington was the birthplace of two Civil War generals, one who fought for the Union and one who fought for the Confederacy. Kentucky was so torn by the war that, at times, the merchants in Maysville were unsure which currency to use to pay their laborers, knowing that if they paid them in the wrong currency it would have no value when the war was over. 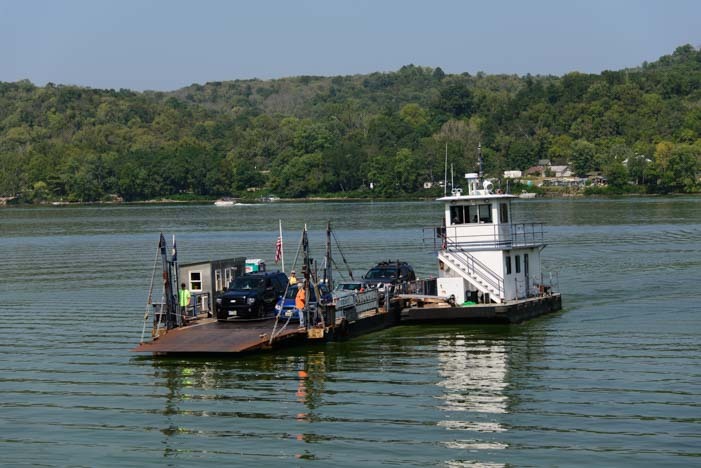 Just a few miles away in the town of Augusta, the Augusta Ferry is a really fun way to get out on the Ohio River. The ride is free for foot traffic and is $5 per car. It takes just a few minutes to cross the river, and it goes back and forth all day long. “What’s on the other side?” I asked the boatman as I took a spot by the rail. Oh gosh, ask a silly question, get a silly answer! There’s no town on the other side, just a ramp and a dock, so we didn’t get off. But it was fun to see how the cabin compartment of the ferry swiveled around the barge as it turned to go back towards Kentucky. We happened to be in Augusta for Augusta Heritage Days, a fall festival featuring a truly awesome car show. Antique cars were driving all over this tiny little village, and they lined up in the grass on the banks of the Ohio. 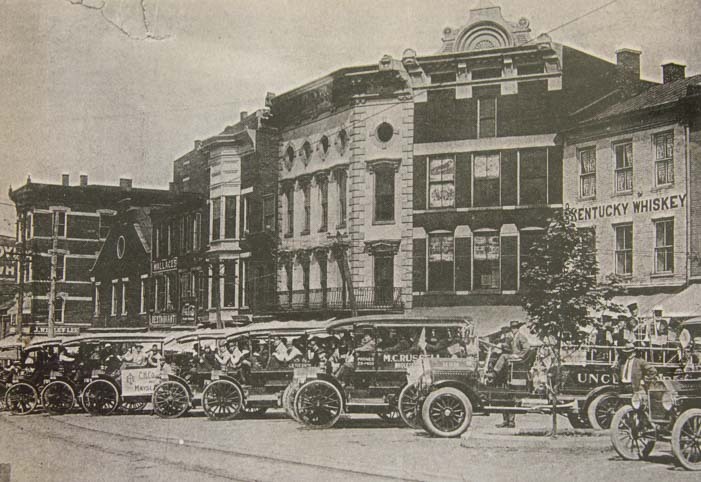 A trolley shuttled people between Augusta’s main drag and the big park where the cars were on display. Mark was in seventh heaven talking to all the car owners, peering under hoods, and admiring glistening paint jobs on sporty cars from every era. 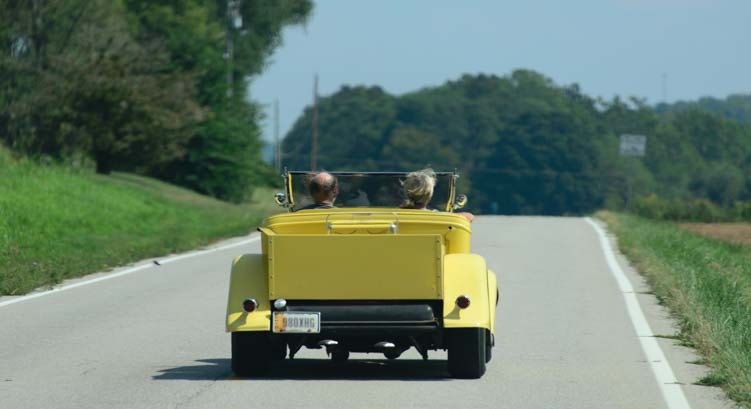 As we drove back to Maysville, we found ourselves behind a really cute little yellow convertible. That’s the way to go! 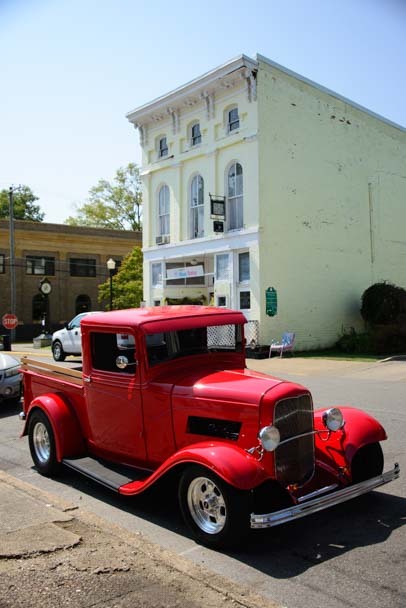 Maysville is steeped in history, and I just loved a photo we saw of Market Street filled with antique cars back when they were the hip new thing to own. 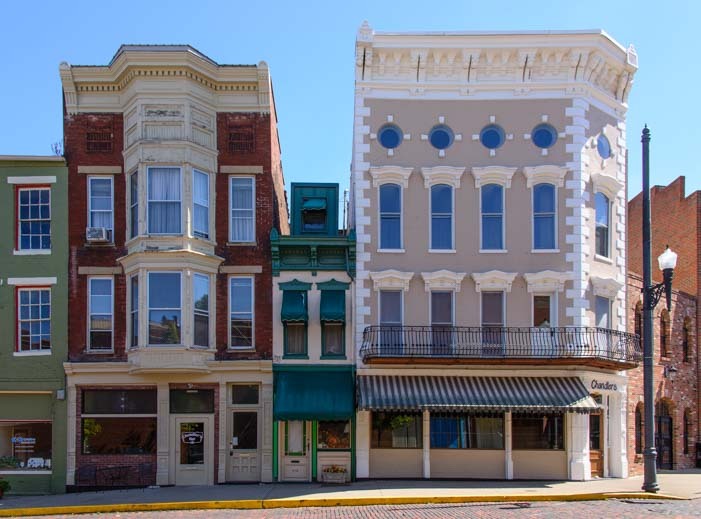 We had been in Maysville long enough that I could now recognize not only Market Street but also the buildings that were still standing and the few that were no longer there. As our happy days in town began to wind down, we ran around getting final shots of the lovely downtown area. We had fun giving them an artsy look. 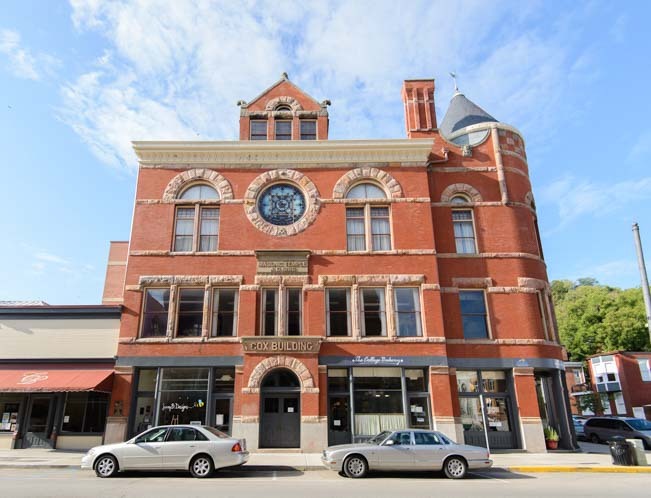 Historic buildings downtown offer an antique flair in modern times. 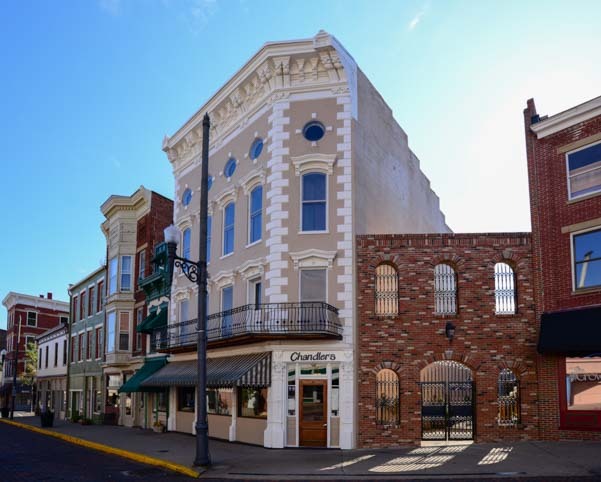 Pretty buildings and beautiful renovations aside, it is the people that ultimately make Maysville special. The warmth, hospitality and friendship we found in this small river town will forever touch our hearts, and we can’t say thank you enough to everyone for letting us feel like locals for a while. Like the sign on the Russell Theater says… Thanks! O’Rourke’s Neighborhoo Pub (Facebook Page) – Great spirits right downtown! 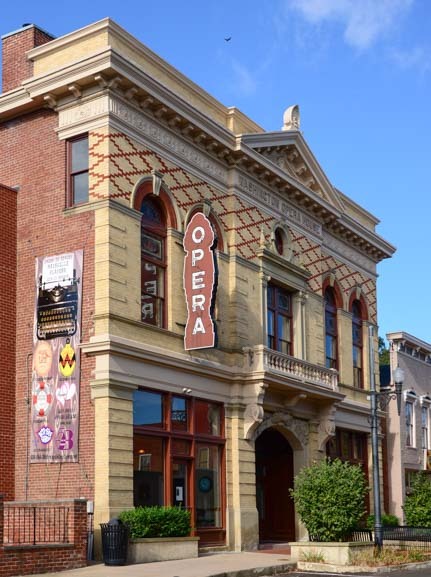 Maysville Players at the Opera House – Catch a performance in this beautiful theater! Augusta Heritage Days – Super car show! We were deeply saddened to learn about a devastating fire in a Maysville apartment building last week that took the lives of a family and their neighbor. Our hearts go out to everyone, and we hope these glimpses of our special days in town last month bring a smile. 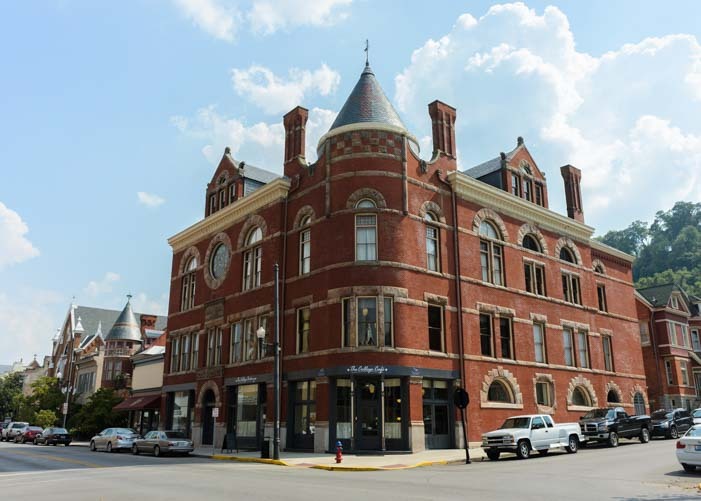 Maysville Kentucky – Tobacco, Freemasons, Miniatures & Clooneys! 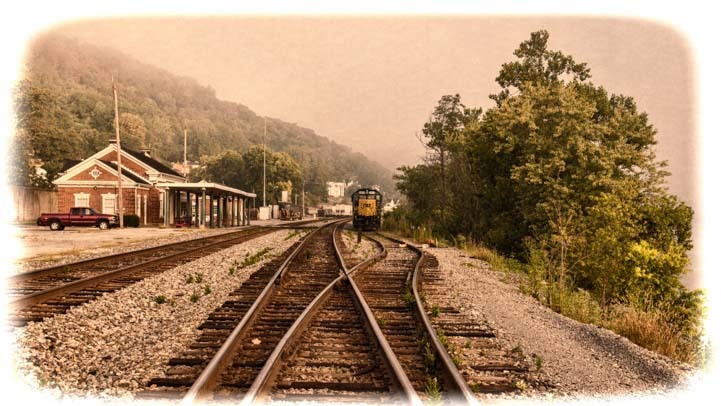 September 2015 – We stayed in Maysville Kentucky for two weeks, and every day was filled with fun things to do. Some of our favorites were various tours we took around town. 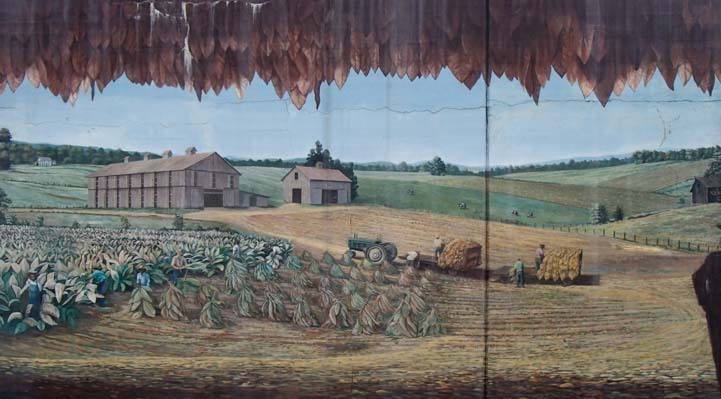 Kentucky is tobacco country, and Maysville once flourished as the heart of the burley tobacco industry. Burley tobacco leaves are what give cigarettes their flavor, and the climate and landscape here is ideal for growing this kind of tobacco. 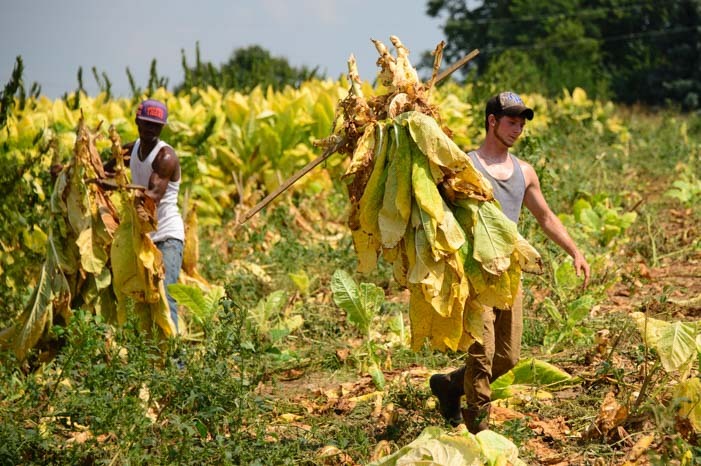 This is a very labor intensive industry, and it seemed that all the guys we talked to had worked in the tobacco fields at some point when they were younger. 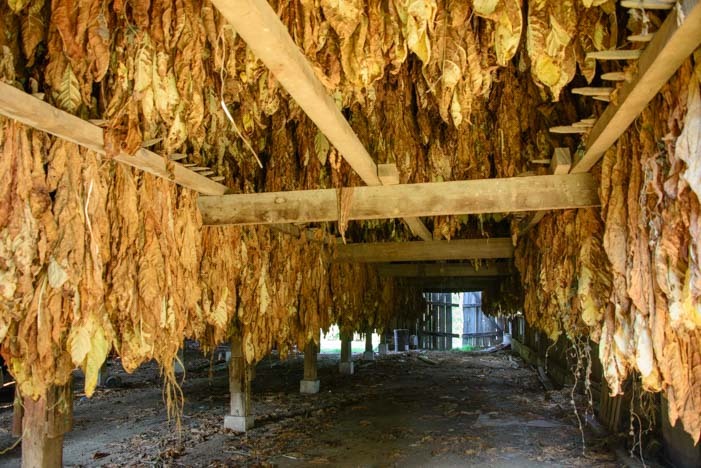 It almost seemed as if it was a rite of passage to spend some teenage years making money out in the hot sundrenched tobacco fields or climbing high up in the barns where the leaves are carefully hung to dry. Our friend Norbert wanted to be sure we experienced this unique aspect of Maysville life, and he took us out to some fields to see the harvesting in action. We’d never seen tobacco fields before, but in no time we could recognize the broad, yellowing leaves from a distance. 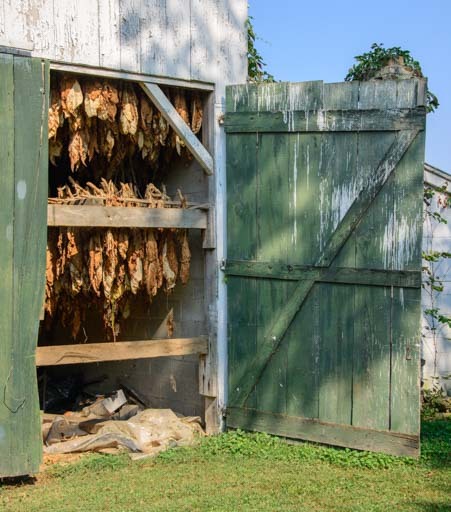 We wandered in and out of a few barns utterly wide-eyed at the painstaking effort it takes to cut and dry a tobacco plant’s precious leaves. Apparently, farm machinery has been developed to take some of the back breaking effort out of the cutting process, but it doesn’t do the job nearly as well as human hands. As sweat poured down our brows in the sweltering Kentucky sun, we watched a bunch of strapping young men bounding on and off of tractors, cutting the leaves, loading them up on trucks and driving them off to the barn. 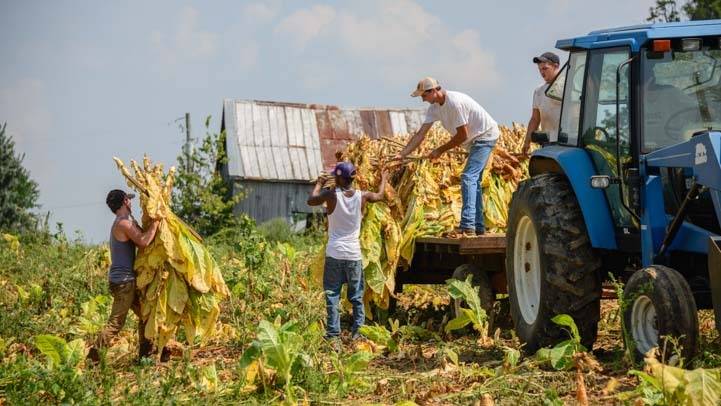 Cutting tobacco is very labor intensive work. As we followed a truck to one of the barns, we noticed other trucks loaded with tobacco leaves on the roads too. This was cutting season, and now that the plants were ready to be harvested, it was all hands on deck to get it done. In the barns, we watched in amazement as these young men leaped up into the rafters effortlessly. They were nimble, strong and quick on their feet. Sidestepping out along the beams, they each took a wide stance facing the racks of leaves, and then the bucket brigade began. Guys on the ground unloaded the leaves from the truck and passed them up to waiting hands in the rafters that, in turn, passed them higher. And so it went, up and up and up until the guys at the top placed the leaves on the racks to dry. When we first arrived, everyone kept sending us to the Cox Building. Afterall, not only is it home to the College Cafe, with its yummy desserts and inexpensive gourmet Friday lunches, but it also houses the visitors center on the second floor. When we poked our heads inside the door of the visitors center, we saw an enormous corner office with a big desk and huge windows overlooking the town. Suddenly we heard a perky, welcoming voice greeting us, and we quickly got caught up in a rapid fire conversation with a petite and vivacious gal named Suzie. 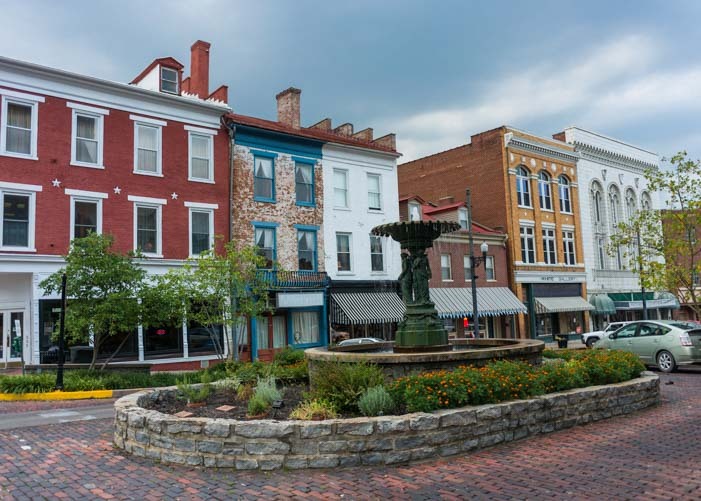 As she talked to us about how much she loved living in Maysville, we were struck that she didn’t have even a hint of that leisurely, drawn out Kentucky drawl we’d been hearing around town. She spoke with a British accent! She was talking so fast about the history of Maysville and the history of Kentucky that I was still scratching my head to figure out out how a Brit came to be the visitors center’s hostess of this very cool and quintessentially American town as we found her leading us up the stairs on a tour that would soon reveal the many hidden secrets of the stately yet mysterious Cox Building. But how unique and special it is that a small town filled with people who grew up together welcomes not just tourists but new residents with such open arms! You’d never guess what lies inside this building! 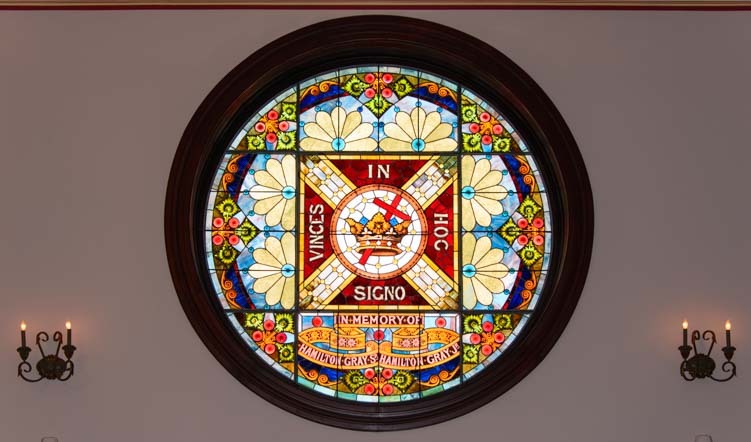 It turns out that the Cox Building is a Masonic Temple and that the Freemasons of the York Rite Knights Templar built it to their very unusual specifications over a century ago. 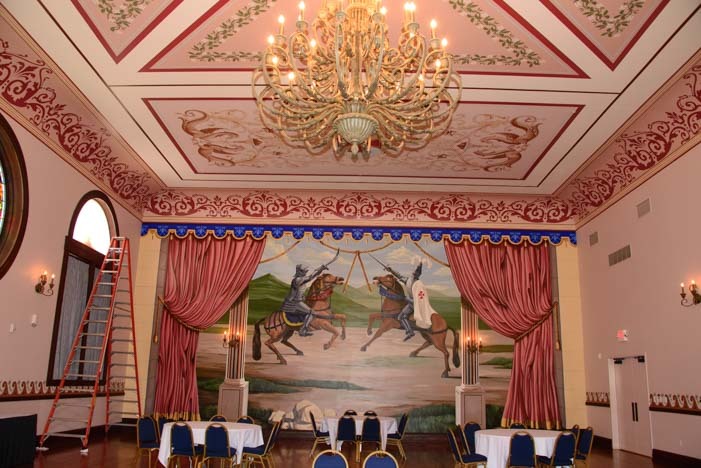 In the last few years, the building has been lovingly restored, and by some stroke of luck, what might have been a very superficial makeover was given a chance to become a very detailed restoration. A beautiful stained glass window in the Cox Building. Back in 2010, the Cox Building suffered a terrible fire caused by the heat of a workman’s light igniting the tinder dry interior wood. The whole town watched in horror as flames shot out of the turrets (there are heart wrenching photos of the fire on the first floor of the building). That fire could easily have been the end of this magnificent building. However, a wise insurance agent had insisted that the town guard against disaster and insure the building for its true value. So, when this disaster struck, they were financially prepared. But of course! This is, after all, a town that has been trained to prepare for disaster by the Mighty (and unpredictable) Ohio River! 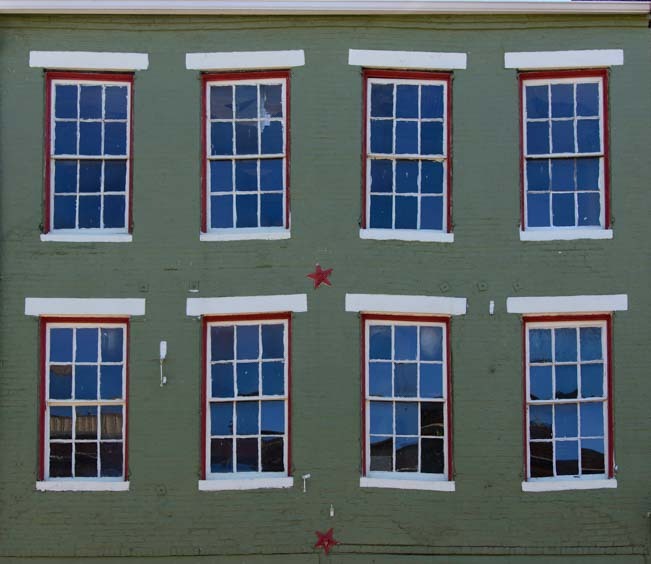 The insurance claim allowed the town to attend to every detail in the building’s reconstruction, and what details there are. 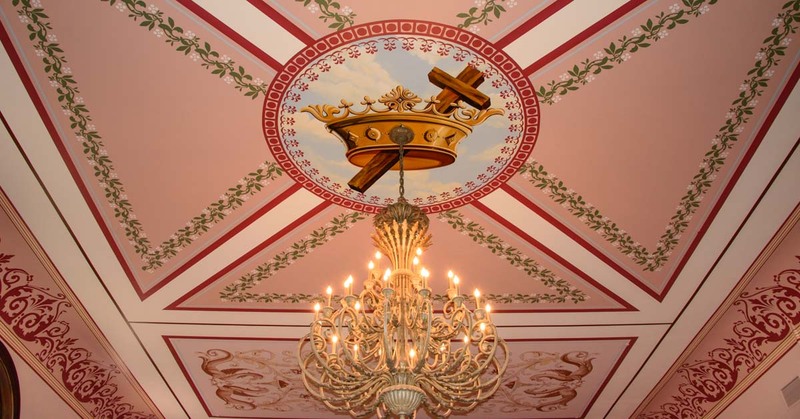 The frescoes on the walls and ceilings are exquisite! I won’t give away all the secrets of the Cox Building here, because the mysteries of the building and its Masonic origins are best experienced in person. The unusual architecture, bizarre staircases, and obscure symbols etched on everything from interior door hinges to exterior stonework all left us reeling. 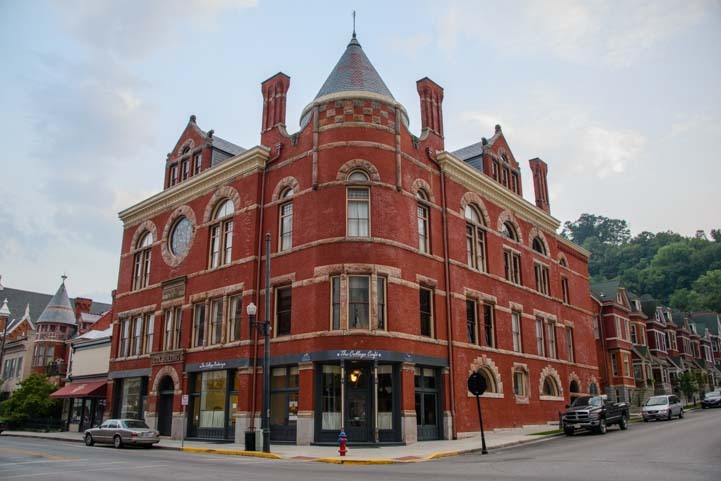 So, we’ll join the chorus: When you visit Maysville, take a tour of the Cox Building! Another special tour we enjoyed was through the Kentucky Gateway Museum. 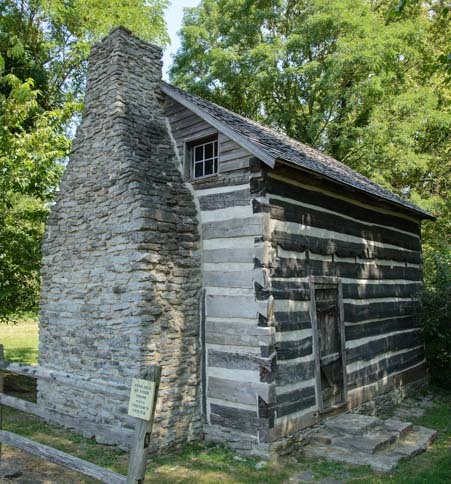 The entire history of Maysville is written out and shown with pictures in great detail, from the arrival of Simon Kenton and Daniel Boone, who settled the area, through the rise of industry, to the rise of the Ohio River floodwaters. (By the way, the Boone family tavern was down by the river and you can see headstones of the Boone relatives buried in the Pioneer Cemetery in town). Our favorite part, however, was the miniatures exhibit. 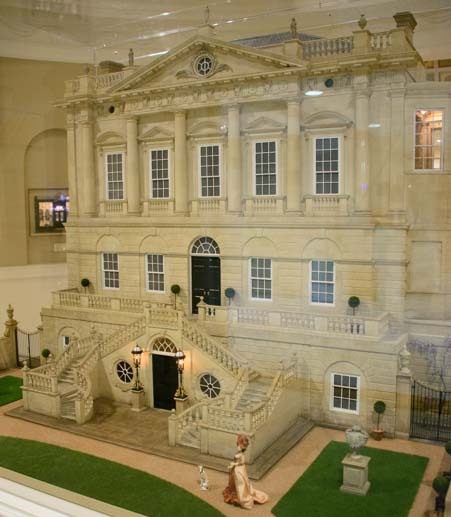 The Kathleen Savage Miniatures collection is a stunning display of building replicas done in exact one twelfth scale, that is, where one inch equals one foot. Photos of the miniature replicas belie their size because the scale is perfect unto itself. This jewelry store is just inches tall. 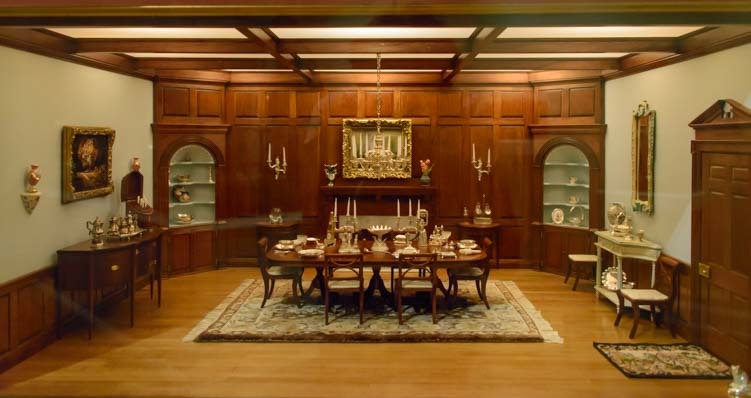 There are living room interiors and dining room interiors complete with furniture and table place settings (imagine a fork or spoon in perfect 1/12 dimensions!). One of our favorites was the jewelry store. 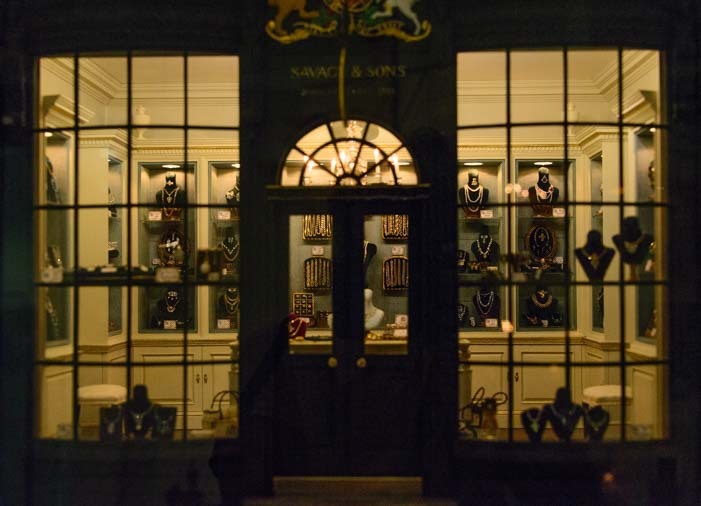 Peeking into the well lit store through the windows and door, you can see jewelry on display. Every piece is crafted with real gem stones! The centerpiece of the whole exhibit is a replica of Princess Diana’s ancestral home. 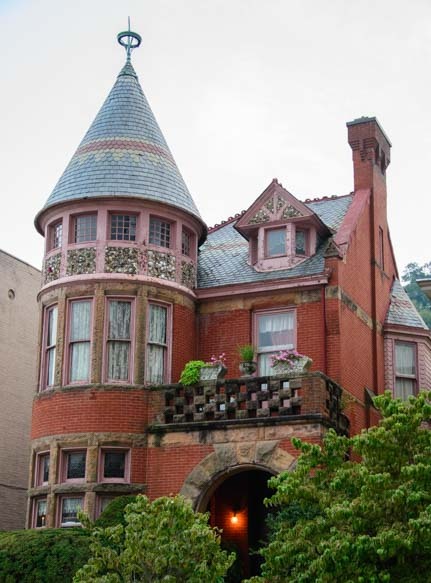 The exterior of this building is extremely grand, and I found that while I was peering at the enormous dining room and luxurious bedrooms I could almost imagine what life would be like inside such a home. Being served at the long dining room table or relaxing in the library almost seemed possible! All of the miniatures have paintings on the walls along with candles and vases and all the other decorations that go with an elegant home. The surprise in Spencer House was seeing miniature portraits of Diana herself! The table settings and wall decorations are all exquisitely made. Maysville boasts another wonderfully skilled craftsman who brings antiques to life, but in full, lifesize scale. 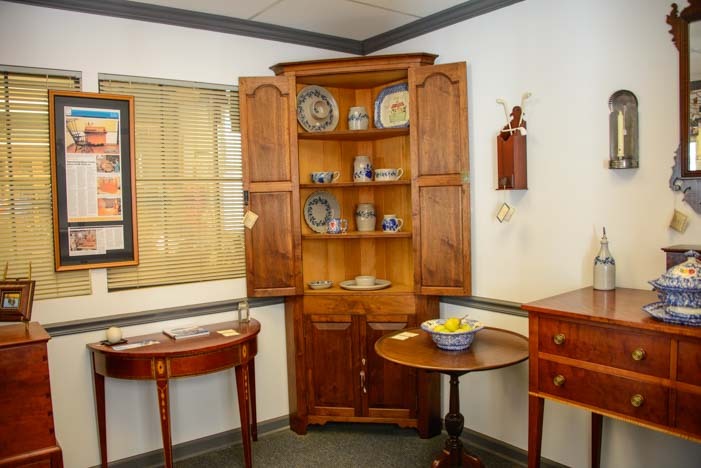 Joe Brannen replicates antique furniture in a wonderful workshop at the end of the main drag in town. We stopped by to visit and were instantly enveloped in the deliciously pungent smell of wood. 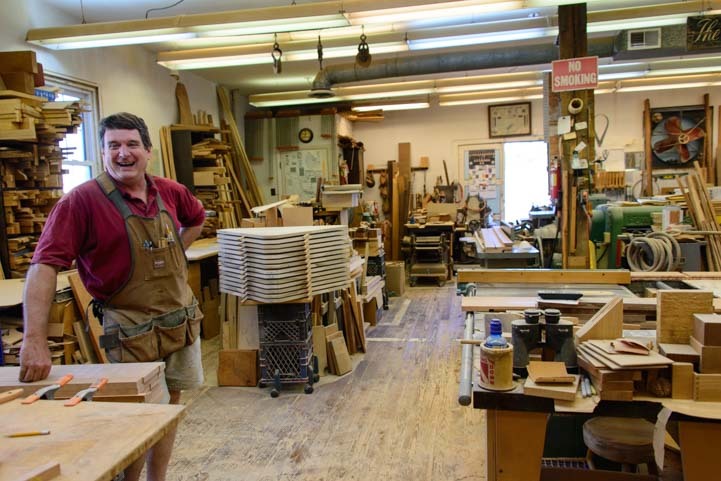 Joe has every woodworking tool imaginable, and there are pieces of wood on the workbenches that are in every stage of transformation from raw wood to fine works of art. Out front we saw the finished products: beautiful pieces of museum quality furniture. Each piece is expertly made, bringing 1790’s furniture to life today. 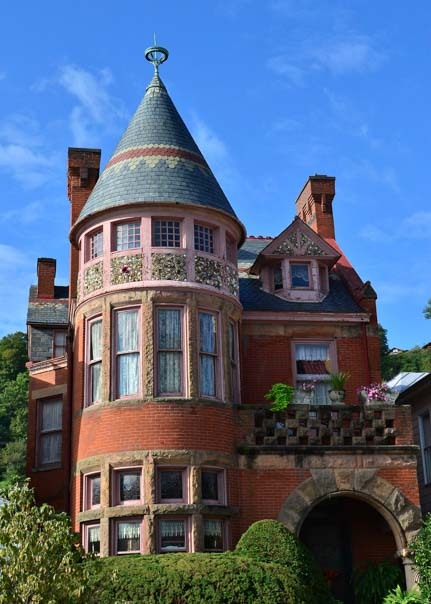 Maysville boasts its own homegrown Hollywood celebrity family fame too. Singer Rosemary Clooney was born in Maysville in 1928, and her nephew, George Clooney grew up in the area. Celebrity sightings are fairly common in Maysville, and when we had dinner overlooking the river at Caproni’s, we admired a huge display of dinner plates signed by all kinds of dignitaries that have eaten there. 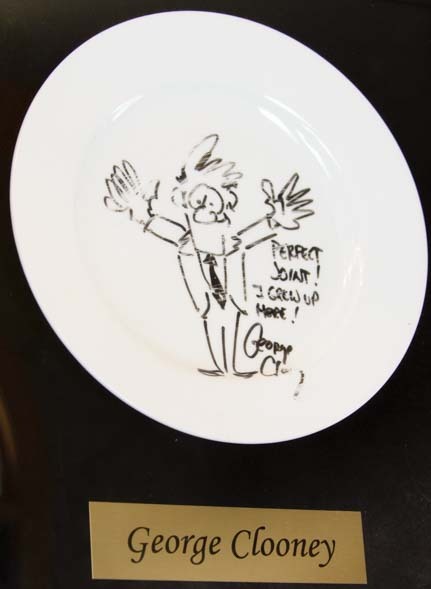 Front and center, of course, was a plate signed by George Clooney! Rosemary’s nephew, George Clooney, ate at Caproni’s too! 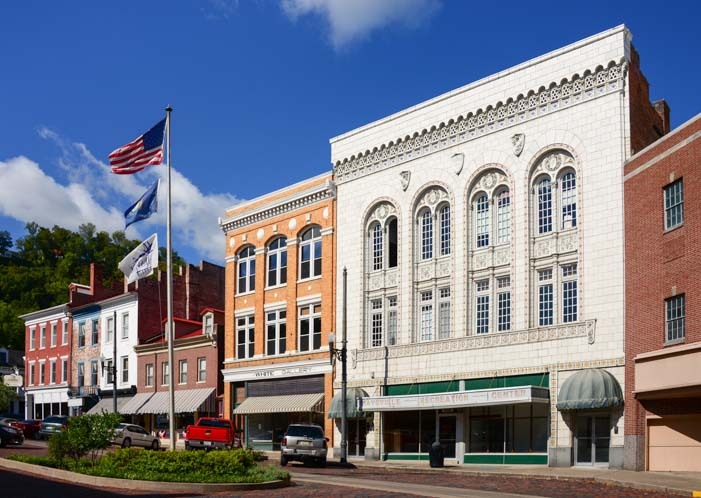 We thoroughly enjoyed Maysville, Kentucky, but what really surprised us during our stay was how many events there were going on. It seemed that every day there was some kind of special gathering, and in no time our usually empty Day Planner was full to overflowing with activities. We just had to stick around! NOTE: The timing of this post is really unfortunate. I discovered after publishing it that in the same moments that I was writing about the Cox Building fire above, another horrific blaze was burning in a group of row houses in downtown Maysville. These were buildings we knew well from our runs and walks in town. Tragically, five people died in the fire, a mother, her three young children and a neighbor. Words can’t express the grief we feel for our special friends in this beautiful and vibrant town as they rally together once again in the face of unspeakable loss. Caproni’s on the River – Italian food with a view! 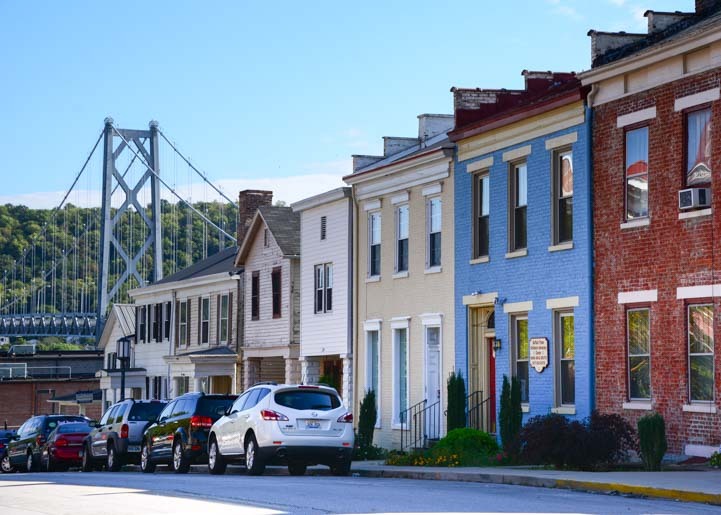 September 2015 – We knew as soon as we got to Maysville, Kentucky, that this was a unique town and that something special was going on here. But what makes one town stand out from all the rest? For one thing, there are some great bakeries that make this town very sweet! 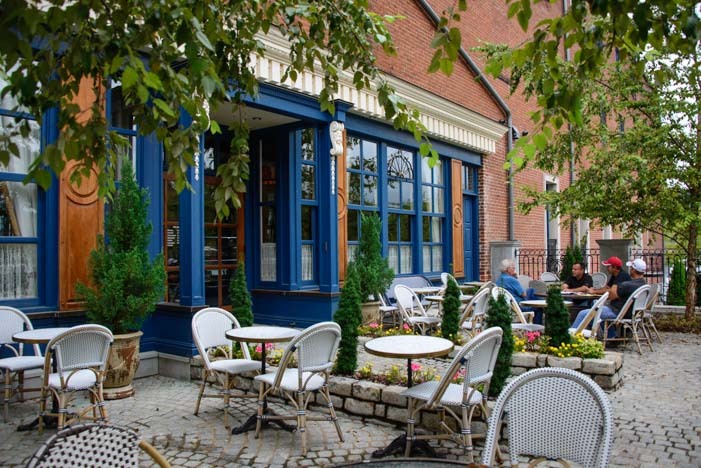 On our first morning in town, we discovered the Parc Café where we found delicious lattés and yummy croissants and muffins in a really pretty setting. During our stay we kept coming back for more, and we found that there were different kinds of goodies coming out of the oven every time we stopped in. 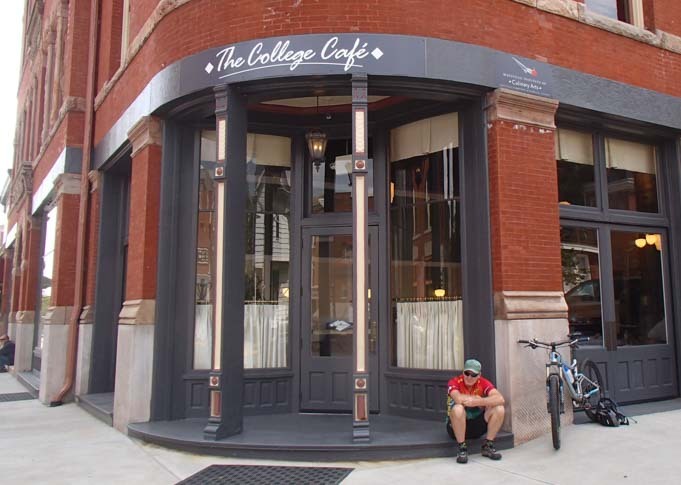 Even more unusual is The College Cafe. This little corner bakery is where the students from the Maysville Institute of Culinary Arts show off what they have learned in class. And all I can say is that whoever is teaching down there really knows their stuff. We dove into sinfully delicious brownies and cookies, and stocked up our RV pantry for later too, and all for pennies on the dollar, because they sell their wares at prices that just cover their costs! Students from the Maysville Institute of Culinary Arts strut their stuff here – yum! But man doesn’t live by bread alone. 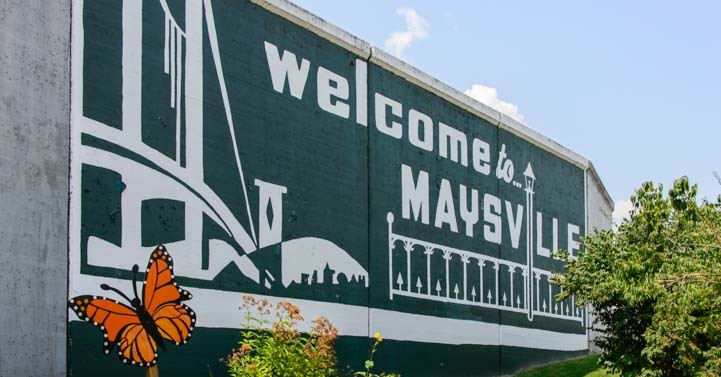 There was something else here in Maysville that drew the town together, made the friendships so strong, and gave us a sense that neighbor helps neighbor and rich and poor rub shoulders without prejudice. As we walked down to the river, we found that Maysville is actually a walled city. Unlike European walled cities, it isn’t walled against human invaders. 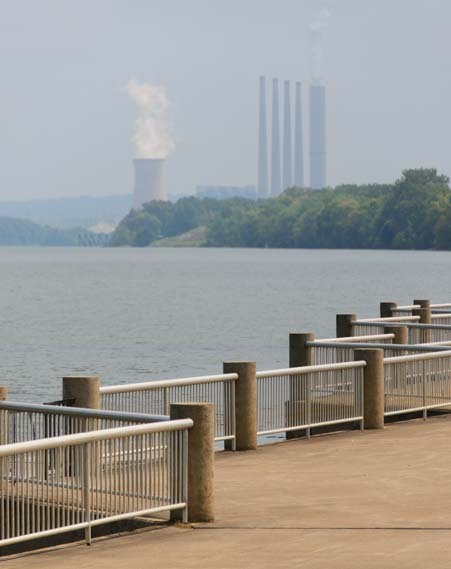 Instead, it is walled against a much more powerful and brutal adversary: the Ohio River. 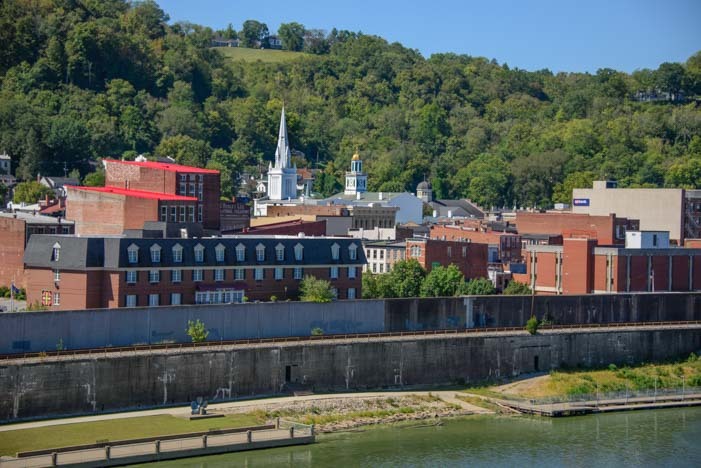 Maysville is protected from the menacing Ohio River by an enormous floodwall. 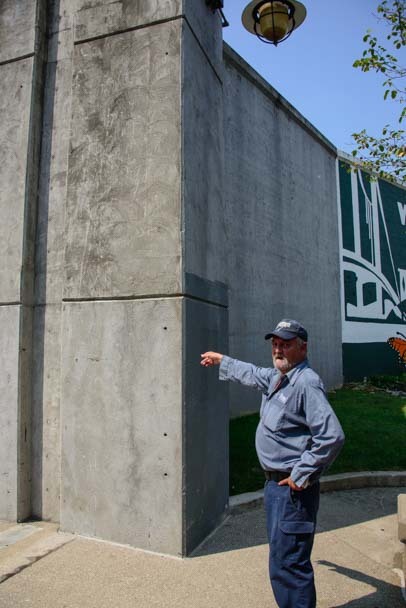 This towering concrete wall protects the town from the river’s floodwaters that have a nasty habit of rising to alarming heights with frightening regularity. The back side of the floodwall, facing into town, is decorated with beautiful and enormous murals that stand two dozen or so feet high. 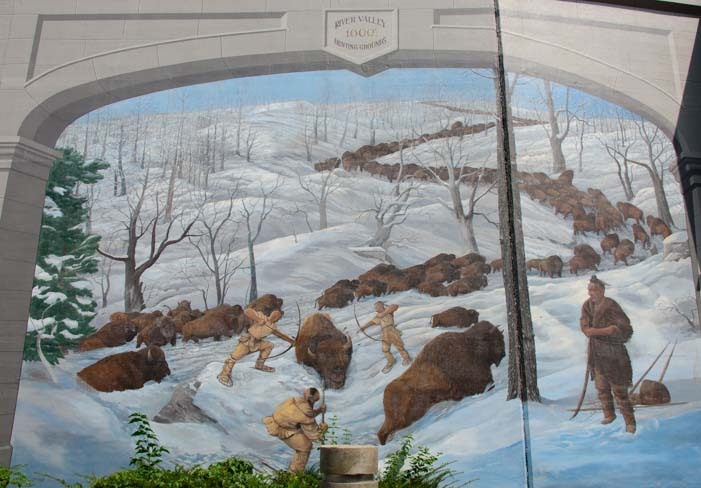 Each one depicts a period of Maysville’s history, starting with the Shawnee Indian buffalo hunters who stalked their prey in the area in the 1600’s. 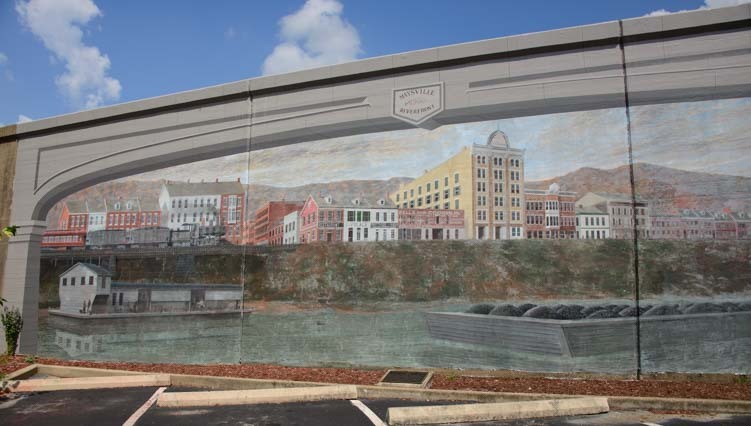 Another mural depicts a later period in the 1800’s when paddle boats cruised up and down the Ohio River, connecting Maysville to distant towns and giving birth to a thriving economy as goods and people traveled up and downstream. A few decades later, the town’s buildings had become much taller and the paddle boats had been replaced by huge barges. Maysville had become a very important port, and industry was booming. 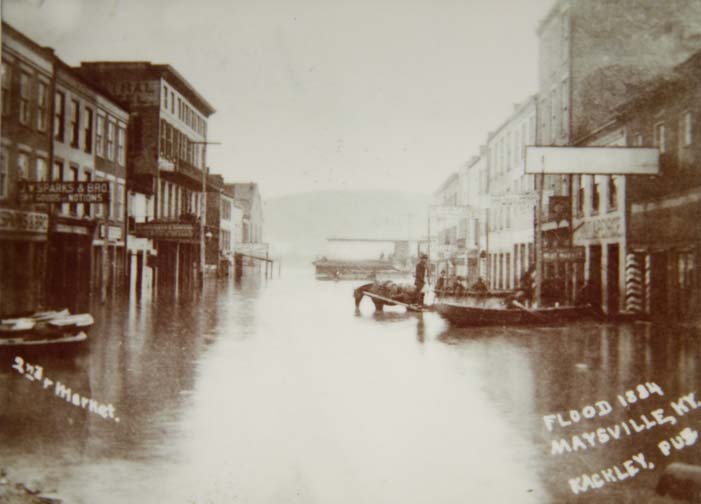 But then the Ohio River flooded the town, first in 1884 and then again in 1937. Spring rains and snowmelt rushed downriver from the north, and the water in the city streets rose higher and higher until the buildings were immersed. The 1937 flood was such a doozy that it wiped out many of the buildings on Front Street right along the river. Rather than giving up in despair, however, the townspeople responded by banding together and erecting an enormous floodwall to protect their town from the river in the future. At Limestone Landing there is a huge floodwall gate. As we walked through, we wondered how the city closed the gate when floodwaters came. 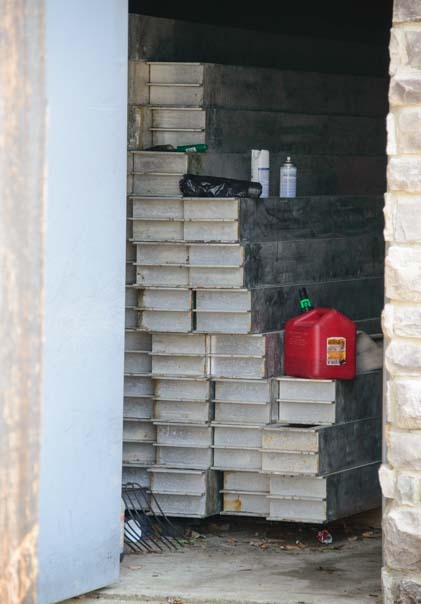 A city worker named Terry showed us the brick partitions that are stored right next to the gate. Would there really be time to get all those things in place? I asked him. Oh yes, he said, you usually get a few days’ notice! I looked out at the placid and seemingly harmless water. The Ohio River sure didn’t look like an enemy, and it certainly wasn’t an enemy that used ambush tactics. Instead, it is a much more sinister foe that gives you plenty of advance warning before it attacks, and then relentlessly advances, inch by frightening inch! It was hard to imagine those floodwaters rising so. Terry described standing on the railroad tracks alongside the river and watching a house float by in the terrifying flood of 1997. Yet the river is very beautiful and placid 99% of the time. Down at the river’s edge the town has built a wonderful zig-zag boardwalk where we watched barges pushing cargo up and down the river under the Simon Kenton Memorial Bridge. 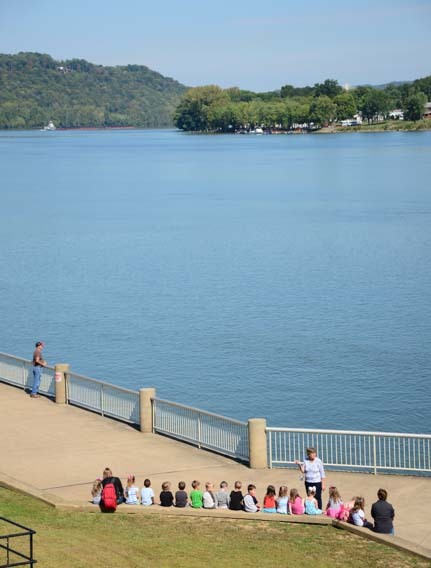 One day a school class came down to the river to watch an old World War II ship sail past, and we listened from a distance as they were given a little lesson about the geography of the states of Ohio and Kentucky and the river that runs between them. In the distance we could see a power plant that also relies on the river for its operations. 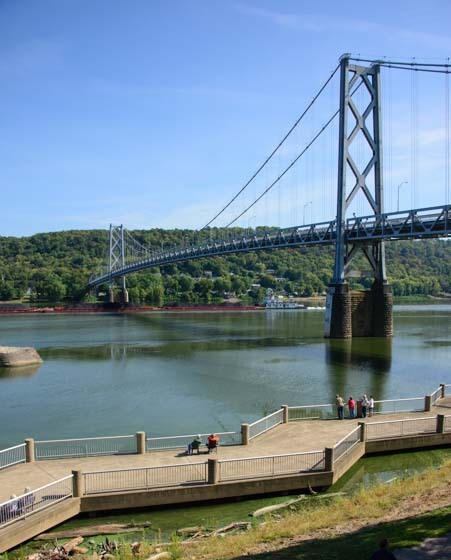 The Ohio River plays an important part in many aspects of day to day life here. And just as the barges carry goods up and down the river day in and day out, trains have done the same thing right next to the river for a century. Trains parallel the barges next to the river. 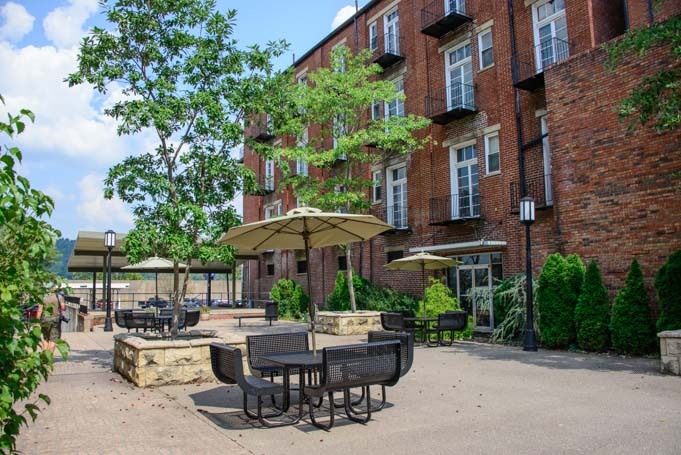 Maysville is a waterfront town, and Limestone Landing is a great place to enjoy the beauty of the river. 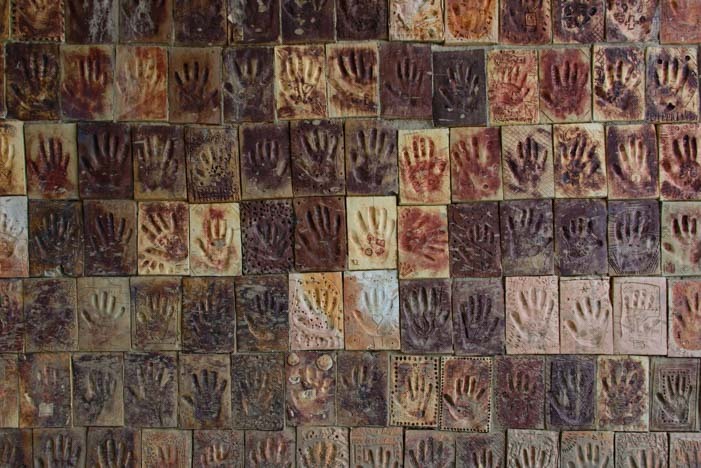 From the floodwall gate a tunnel goes underneath the train tracks to the river, and hundreds of clay tiles line the tunnel walls, each one imprinted with a child’s hand. This very cool riverside artwork was a school project in the mid 1990’s. 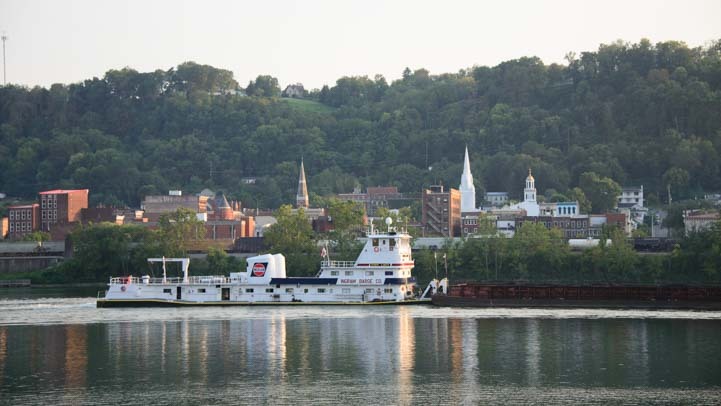 We’d never spent much time in a river town before, and as the days passed we began to realize just how deeply the Ohio River is integrated into Maysville’s soul. It’s not just that the river gave rise to the town’s early settlement and burgeoning economy two centuries ago. It is simpler and yet also more subtle than that. 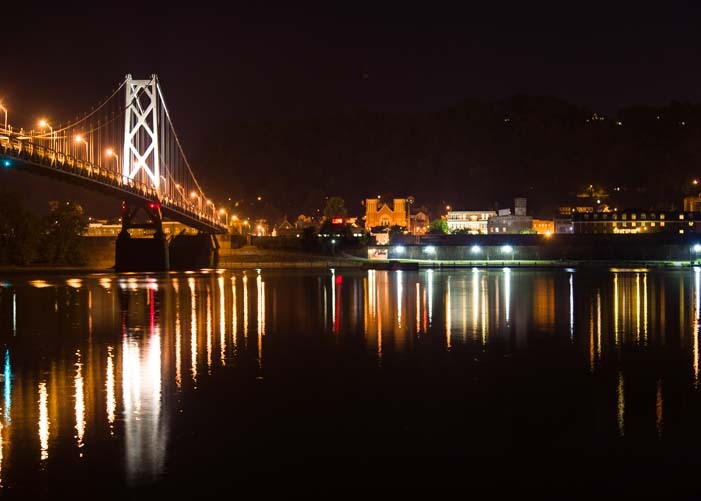 The Ohio River put Maysville on the map, but in return, it has reminded the town, in startling 50-60 year intervals ever since, that it also has the ability to take it off the map! The oldest folks in town remember the horrific devastation of the flood of 1937. Most everyone else remembers the flood of 1997 when the river crested just shy of the top of the flood wall. As this barge floats past Maysville, it’s hard to imagine how devastating an Ohio River flood can be. But Maysville gets plenty of small reminders of what the river can do in between those mammoth floods. 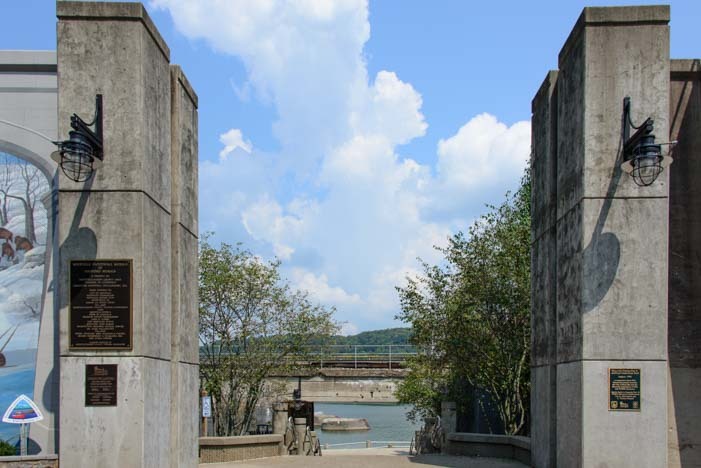 Last year’s heavy snows and rains brought the river almost to the base of the floodwall in the spring, covering the zig-zag boardwalk by many feet and rising through the clay tile decorated tunnel and going right up the staircase that leads to the floodwall gate. It did the same thing a few years earlier. 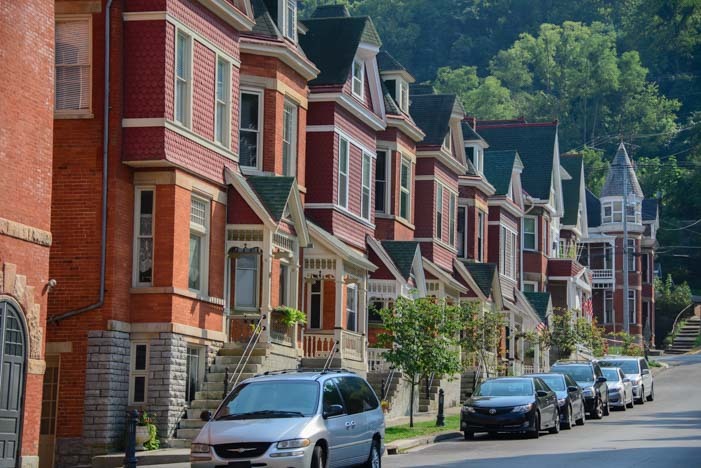 Without a doubt, living with a neighbor — and benefactor — just over the wall that is as temperamental as the Mighty Ohio River will shape a town’s personality. 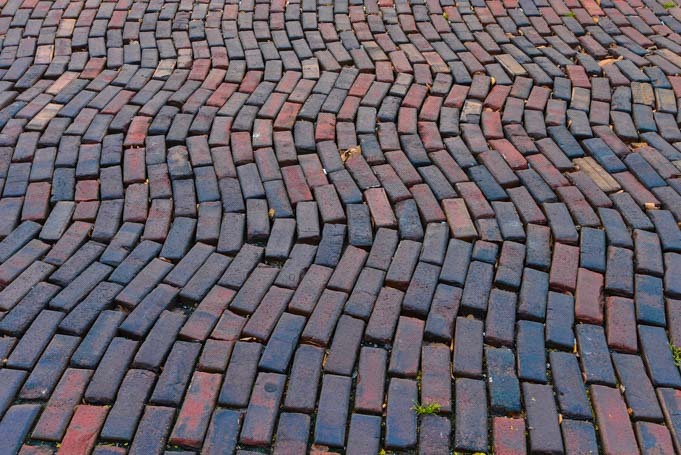 Perhaps it has united the community in ways that other towns never experience. 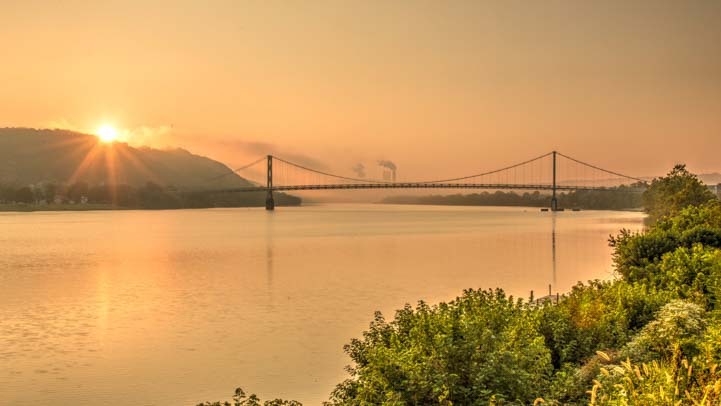 Keeping the river at bay must be a special source of pride, and certainly everyone we met expressed a genuine affection for Maysville that is far deeper than most people feel for their hometown. Life is short and uncertain — eat dessert first! 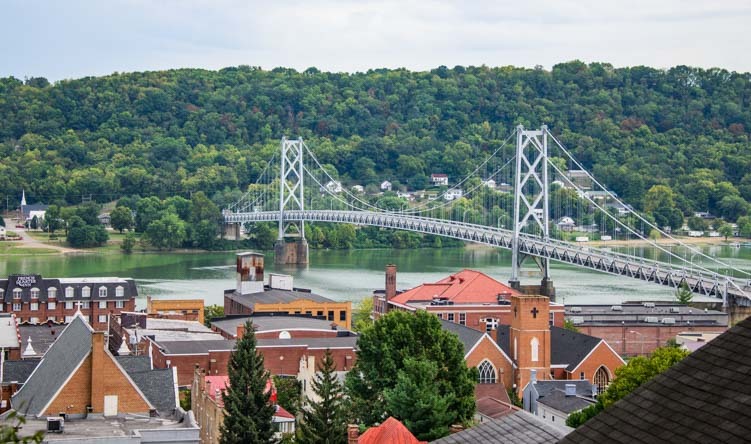 High up on 6th Street we got an awesome bird’s eye view of the town and the river as we looked across the rooftops at the two suspension bridges, the older Simon Kenton Memorial Bridge and the very modern William Harsha suspension bridge in the distance. 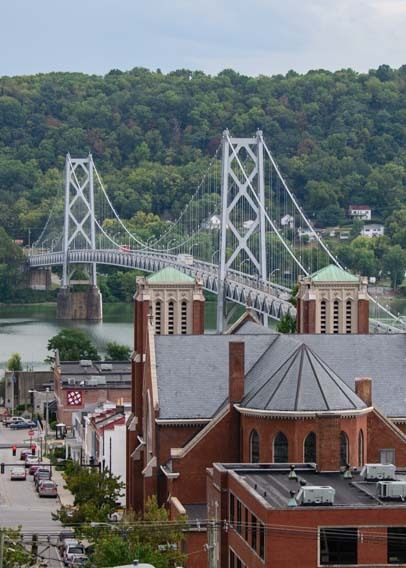 Maysville is flanked by two beautiful suspension bridges. 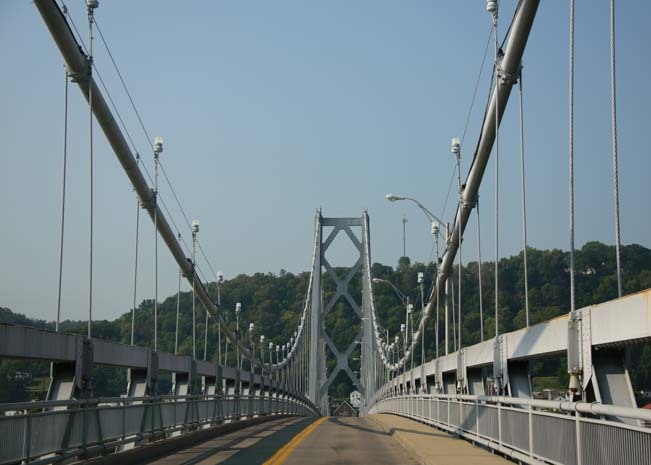 The William Harsha bridge in the distance has a wonderfully sleek and modern design. 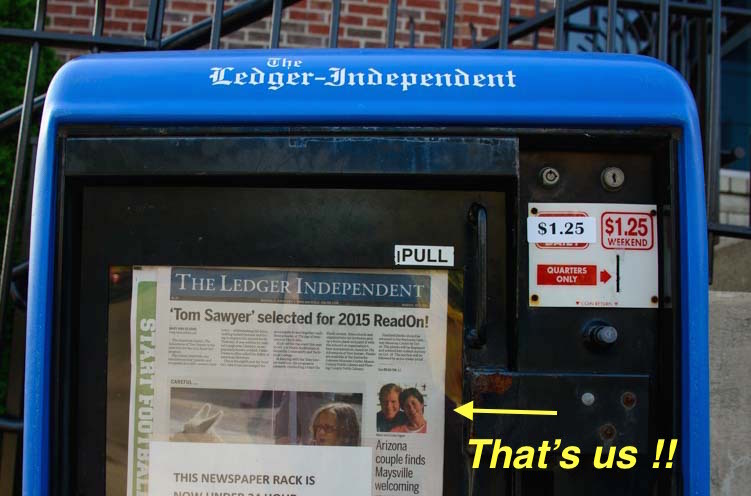 OMG – We Made The Front Page! 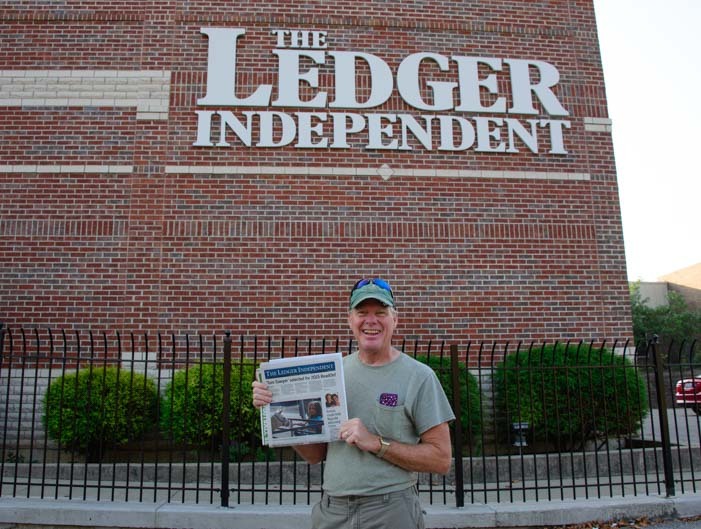 We went out for a walk this morning around the very cool town of Maysville, Kentucky, where we’ve spent the glorious past few days, and what a shock it was to see our faces peeking out from the front page of the paper inside the newspaper box. Hey… That’s our picture on the front page! No, we’re not wanted. At least, not yet. We’re just having a blast! And we’ve gotten swept up in the happy vibe that fills the air of this small town. Where exactly are we? 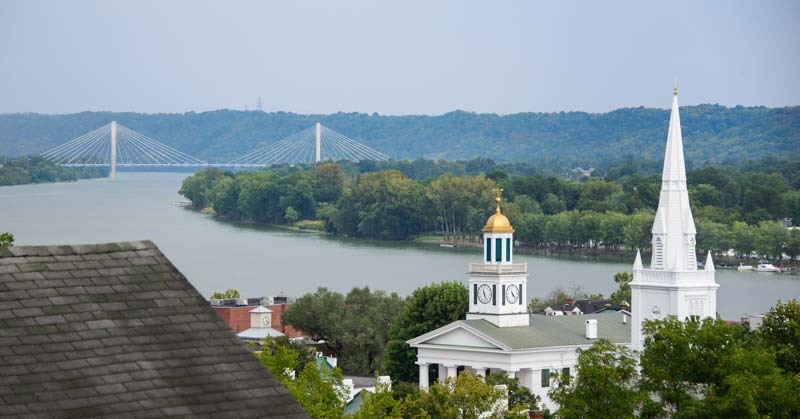 We’re in Maysville, Kentucky, a little town on the banks of the Ohio River, right on the northern border of Kentucky. We’re in the heart of tobacco country on one of early America’s most important shipping routes that shaped our country’s history. You can see the location here on Google Maps (you can zoom in and out on the map for directions). 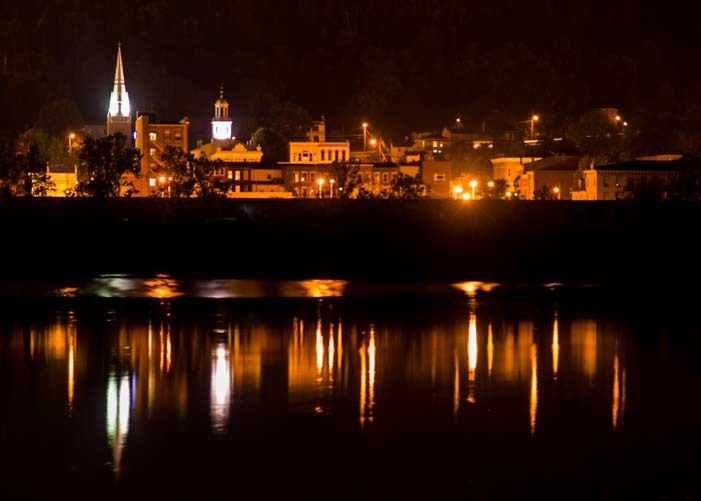 And what makes Maysville so special? Well, first of all, it’s so darned cute! 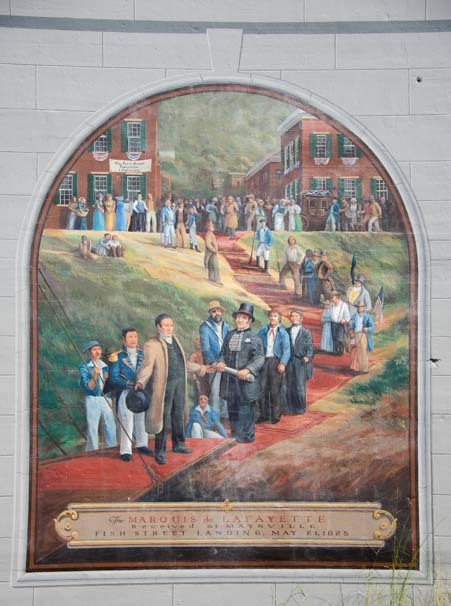 The way Maysville looked years ago — painted on a huge mural on the town’s flood wall! 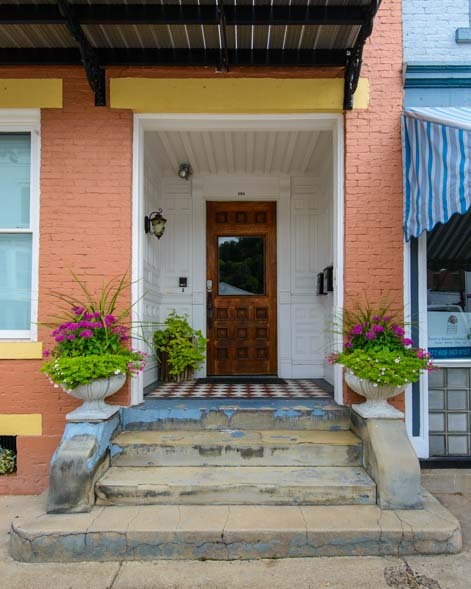 There is loads of history in this town, and the downtown streets have been renovated to show off the utterly charming architecture of a precious but long gone era. 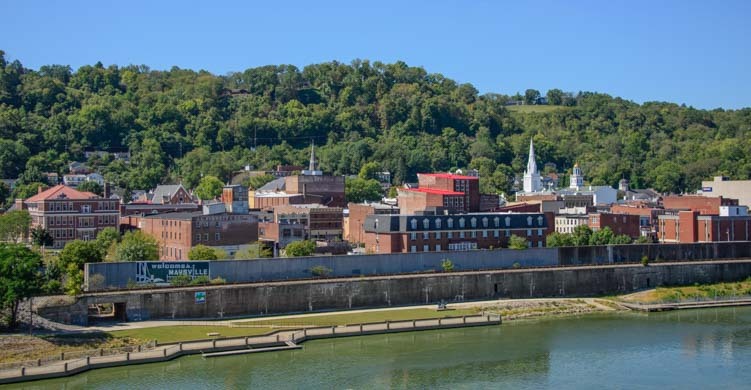 To protect themselves from the Mighty Ohio River, this spirited town built an enormous flood wall. 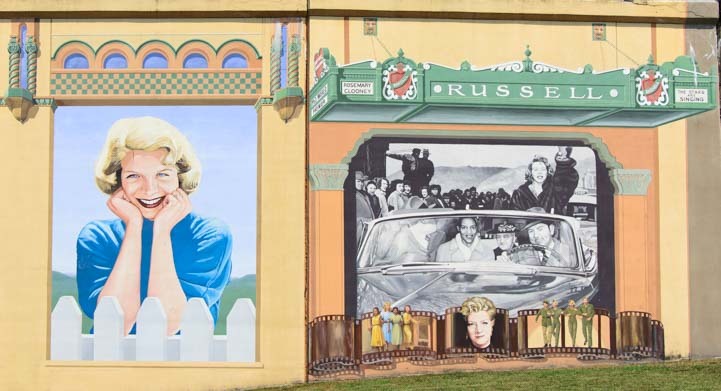 And rather than leave the concrete on the city side of the wall drab and dreary, they decided to paint a series of wonderful murals that depict the history of the area! 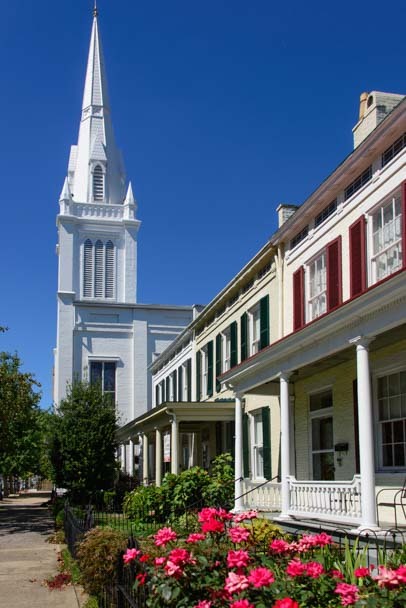 But more than the architecture, the fun murals, and the wonderfully walkable streets that are amazingly free of traffic, it is the warm and friendly spirit of this place that has totally captivated us. Beginning with a city worker who took time out of his day to explain to us the workings of the flood wall that protects the town and to describe the major floods of the 1880’s, 1937 and 1997 that were truly frightening in their proportion, everyone in town has welcomed with open arms. Terry shows us just how high the flood waters have reached. This is a town that has roots going way back, and almost everyone, it seems, has lived here their whole lives. It’s a tight knit community, and one that you’d expect to be hard to penetrate. Yet, as simple tourists off the street, we have found ourselves not only shaking hands with the mayor at the local neighborhood pub, but sitting in his car as he took us on a personal tour of the sights around town! How many places can boast friendliness like that? This place oozes charm and is filled with pretty buildings. “It’s just southern hospitality,” Mary Kearns told us when she dropped by our trailer to interview us for the local paper last night. It’s a lot more than that. 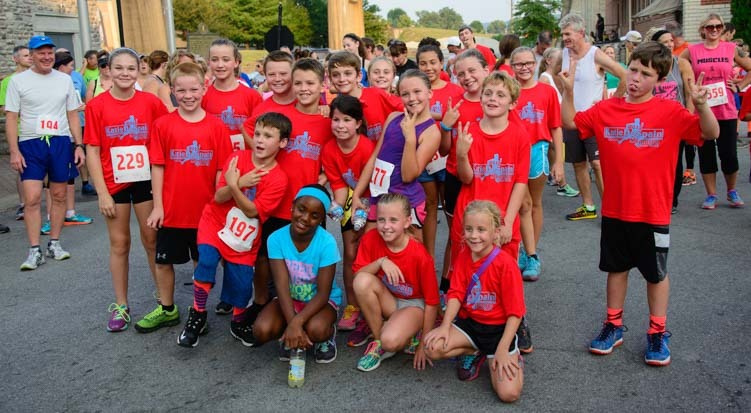 When the town turned out for a 5k run on Saturday afternoon, the city streets naturally shut down and turned into a huge block party. A mobile DJ played great tunes well into the night, and the town kids suddenly jumped up on a picnic table to give the crowd an impromptu dance show. 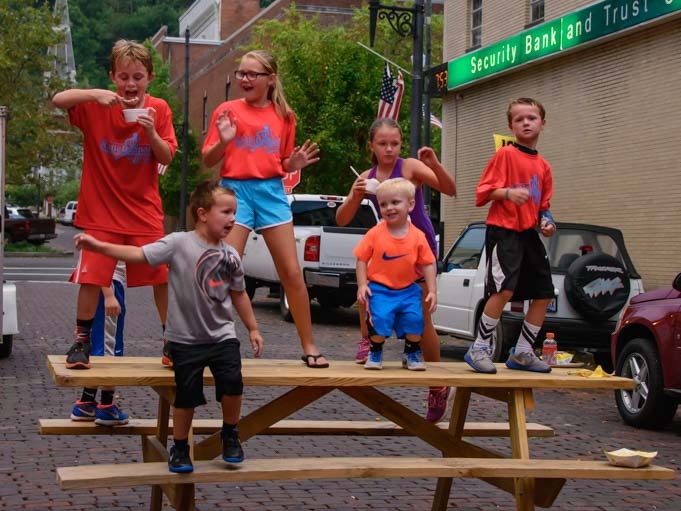 After the 5k run, some kids burned off their excess energy dancing on a picnic table in the town streets! Unlike many small towns we’ve visited, however, where the visitors centers are right out front and center, loading folks up with tourist literature and tourist activities, we had to go hunting to find the visitors center here! It’s up on the second floor of the incredible Cox Building! And rather than filling our arms with reading material, the town’s very enthusiastic Director of Tourism, Suzie, took us on an in-depth guided tour of the building, revealing some astonishing secrets and mysteries that her dogged sleuthing had uncovered during the building’s renovation a few years ago. The Maysville Visitors Center is in the 2nd floor of the Cox Building. But far more interesting than any tourist lit could ever be was the tour Suzie gave us of this mysterious building itself! 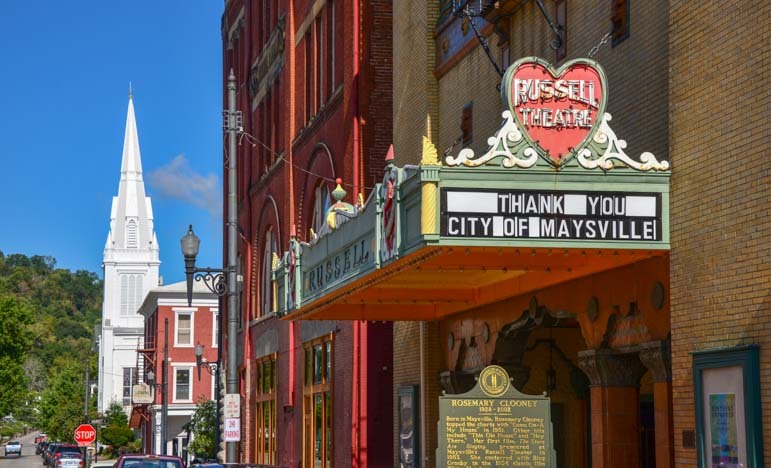 Lovely and fascinating as the beautiful buildings of this town are, however, the heart of any community lies with its people, and that is true in Maysville more-so than in any town we’ve ever visited. 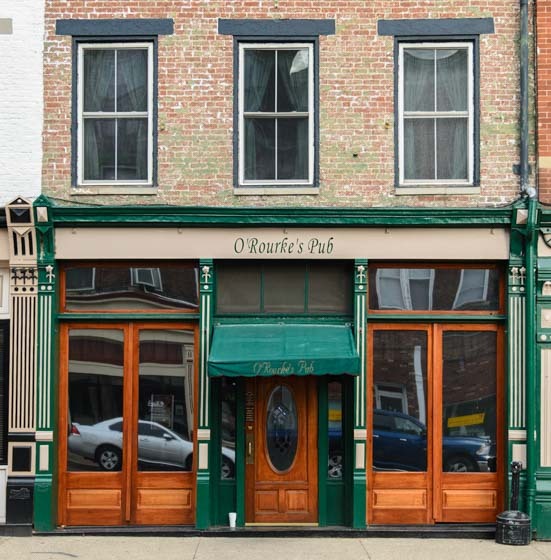 The hub of downtown is inside O’Rourke’s Neighborhood Pub and in the flurry of action that always spills out around it. The owner, Norbert, took us under his wing on our first day in town, and drove us on an all day tour into the hinterlands where a few remaining fields of tobacco are just now being cut and harvested. Those gently waving leaves of tobacco gave this area a magic carpet ride for a long time, but that ride has ended. The miracle to us is that even though the rug was pulled out from under this community, something that would have left many other towns devastated forever, this town has decided to have none of that and is thriving today with a spirit and joy that is hard to find anywhere. 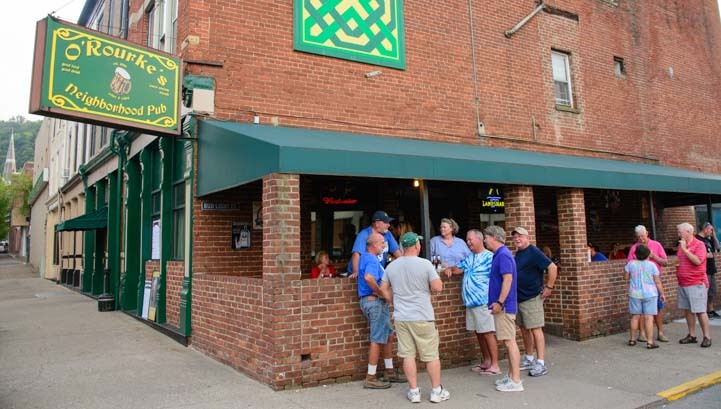 O’Rourke’s Neighborhood Pub is where everyone gathers in Maysville to spend time with friends and catch up on the local news. Many nights the party spills out into the streets! Does it sound like we’ve been given the keys to this city? We sure have! And not for any reason other than we rolled into town and started talking to the friendly people on the streets. 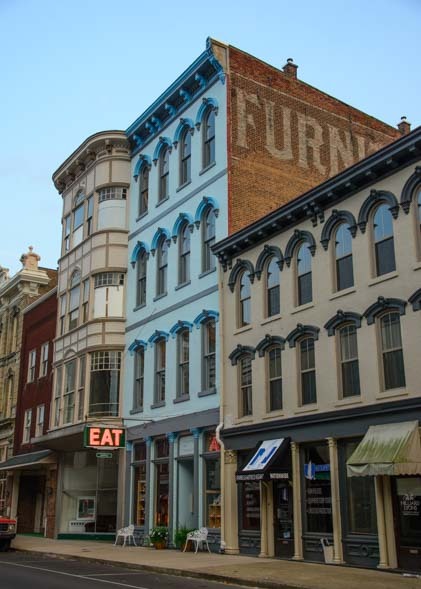 We’ll be telling the rest of our tales from Maysville soon, but for right now, we want to get back out on the streets of town to enjoy all it has to offer!